Description:This HDMI Cable Tester is designed to check and troubleshoot the pin connections of HDMI Cables. 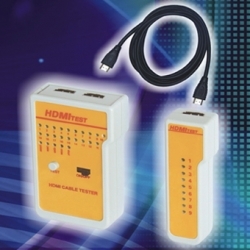 Automatic Sweep Mode,Automatic on and easy to operate,Sweep 19 pins for HDMI cable quickly and easily checks for cable continuity,open,short,reversed or crossed,whatever the cable was installed or not. LED indicator on both main unit and remote unit. Select switch the tester to SWEEP mode. Test all pins signal of HDMI Cables.